With a strong belief that technology is a key enabler to realize the vision of effective primary care, ICTPH has developed IKP-TechPrima, a cloud-based, web application that powers primary healthcare delivery. IKP-TechPrima captures electronic health records for protocol-driven physician-patient interactions. It has fully functional units for supply chain management, subscription-based chronic disease management and integration with android based mobile platforms for enrolment, risk assessment. Family enrolment for all households in the catchment with geo-tagging for effective disease profiling and surveillance. Management of electronic health records, facilitation of structured physician consulting process (through the methodical SOAP – Subjective, Objective, Assessment and Plan – approach) and primary care operations such as pharmacy management, visit management, etc. Fully functional units for subscription-based chronic disease management, integration with android based mobile platforms for enrolment and rapid CVD risk assessment; and supply chain management. Data capture with clinical focus and user-friendly options such as selection of pre-filled symptoms, diagnosis, etc (instead of free-text entry by typing) which reduce errors, minimize data entry time and also help in automated analysis. Potential for customization and application to different settings, including field-level interface. Community focus: The features such as household-level enrolment, geo-visualization of disease conditions largely shift the focus towards family health and community health – that are core components of public health. “Care first, Operations next” approach: The focus is primarily on clinical aspects of physician-patient interaction, unlike similar software that incline towards the operational aspects. Exclusive Chronic Disease Management Features: With chronic diseases accounting for high death rate (as high as 40% in rural India), chronic conditions should be managed at primary care settings on a continuous basis (unlike an acute condition). A specific “Chronic Care Management” module is available with the following features – Chronic Care Package configuration, Package enrolment, Service delivery management, Patient follow-up calendar, Renewals notification and tracking. Varied User categories: IKP-TechPrima can be utilized by both individual primary care providers and providers in a network of primary care clinics. The design accommodates usage of the software by health extension workers (e.g. trained high school graduates in rural primary care clinics) as well. MIS Reporting: The MIS reports generated out of IKP-TechPrima help to govern the implementation of various healthcare programs and projects. Research, Policy and Program Implementation Support: The design of IKP-TechPrima helps to analyse data for various research and policy needs at different levels –community level, disease level, care delivery aspects. 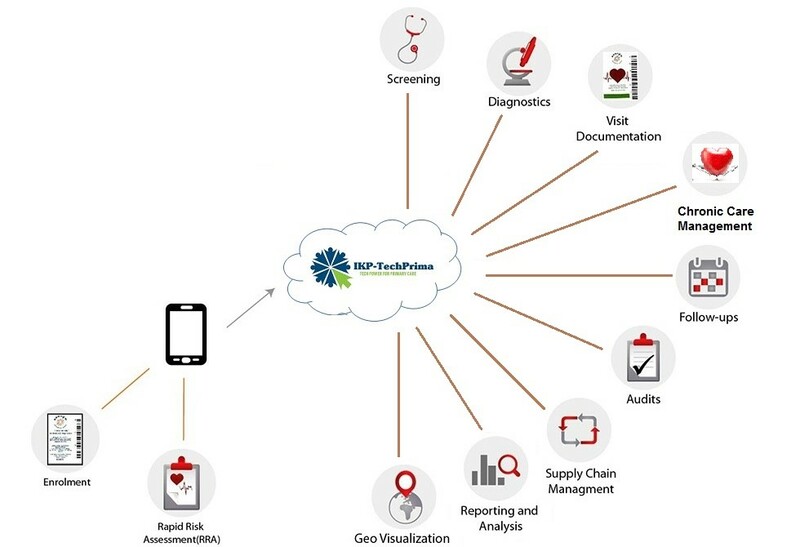 SughaVazhvu Healthcare (sughavazhvu.co.in) uses IKP-TechPrima as backbone for its field operations. ICTPH has entered into an agreement with a Jharkhand-based primary healthcare provider to implement IKP-TechPrima to power their operations. ICTPH has executed a “proof of concept” for a reputed Chennai-based mental health services provider to demonstrate ability to handle mental health records at primary care settings. ICTPH is open to partnering with more primary healthcare providers and supporting their operations with IKP-TechPrima. Please contact IT@ictph.org.in for further details.